This year we had our 8th annual chili cook off and as usual, had the time of our lives with the best of friends. I am always surprised at the turn out we have. One never knows who will show up. This year I had to change the day from Saturday to Friday as lots of rain and a cold front was heading this way. So glad that didn't deter them from coming as they had all worked that day. Every year we always plan on burning a bonfire and every year we never know if it will be too windy to do so since we live on the lake and way up high. 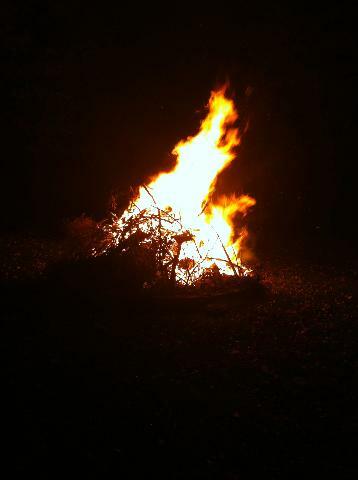 As luck would have it, we were able to burn it but I have to say I'm praying the entire time they are lighting it...bonfires still scare me when they are first lit but once under control all was well with the world. Below is the dessert I made for it. I have been wanting to try a caramel apple cake for years now and glad I chose this one. Since I am not much of a cake decorator I opted for this recipe because it was a sheet cake...gotts love sheet cakes...you cannot go wrong. This recipe is a bit labor intensive but worth every minute you put into it...the icing alone is worth it! Thanks to Motherthyme.com for this wonderful recipe...it's a keeper! Enjoy! Apple Sheet Cake with Salted Caramel Frosting Ingredients: For Apple Sheet Cake: 2 cups all-purpose flour 1 teaspoon baking powder 1/2 teaspoon baking soda 1/2 teaspoon salt 1 1/2 teaspoons cinnamon Pinch of ground cloves Pinch of ground nutmeg 1 cup (2 sticks) unsalted butter, softened 2 cups sugar 4 large eggs 1 teaspoon pure vanilla extract 1/3 cup milk 2 cups peeled grated apples (about 3-4 medium apples) For Salted Caramel Frosting: 1 1/2 cups (3 sticks) butter 1 1/2 cups light brown sugar 1/3 cup half and half Pinch of cream of tartar 3/4 teaspoon fleur de sel or coarse salt 4 1/2 cups confectioners sugar 2 tablespoons milk Directions: For Apple Sheet Cake: Preheat oven to 350 degrees Fahrenheit. Grease and lightly dust with flour a 11" x 17" jelly roll pan and set aside. In a medium bowl combine flour, baking powder, baking soda, salt, cinnamon, cloves and nutmeg and set aside. In a large bowl using an electric mixer cream together butter and sugar. Add eggs one at a time mixing after each addition followed by vanilla extract and milk. Stir in grated apples. Gradually add in flour mixture until blended. Spread batter evenly on prepared pan and bake in preheated oven for 16-20 minutes until cake tester comes out clean when inserted in the middle. Cool completely. For Salted Caramel Frosting: In a medium saucepan combine butter, brown sugar, half and half, and cream of tartar over medium heat stirring occasionally until butter is melted and sugar is dissolved. Bring to a boil and stir frequently for 2-3 minutes. Remove from heat and stir in salt. Let cool. Add cooled caramel, reserving 1 tablespoon in a large bowl along with about one cup of confectioners sugar. Stir using an electric mixer medium speed until confectioners sugar is combined. Continue to add in confectioners sugar in about one cup at at time. Stir in milk until creamy. Spread frosting on cooled cake. Drizzle with reserved caramel (This doesn't drizzle that well so I will skip this step next time). Notes- This can also be baked in a 9" x 13" cake pan for 35 approximately 35 minutes.